This is actually a road on Toronto Island and in the distance are some kayaks. This spring Toronto along with areas in Ottawa and Quebec has seen unheard of flooding (once in 100 years type event). Lake Ontario is higher and closer to us than ever before. Whenever it rains, water pools and rises again because the ground can no longer absorb any more water. It’s full. Lake Ontario is so full it’s pushing its way up from the storm sewers and over breakwaters. In case you need reminding, Lake Ontario is huge. It’s so big it has storms and storm surges like ocean facing coastal areas (though not quite as extreme). Whenever someone visits Toronto, a nice bit of trivia to lay on them is that everything south of Front Street used to be in the Lake and is in fact, reclaimed land. Visitors nod respectfully and may say, “Oh, wow. Neat.” but are really thinking “I wonder if they're filming Suicide Squad 2 here?” Then you point out that the Skydome and the CN Tower are south of Front Street so you know, in the Lake. That gets a little more attention. In Toronto, the hardest hit area is along the lakeshore and Toronto Island. Toronto Island is actually a string of smaller islands. A natural sand barge that forms Toronto Harbour, the islands had Ojibway names so they’ve been there for awhile. The artificial Leslie Spit east of the islands, now known as Tommy Thompson Park is created from construction refuse and actually helps halt the natural erosion of the islands. The islands used to be a peninsula but a storm in the 1850s created the eastern gap. 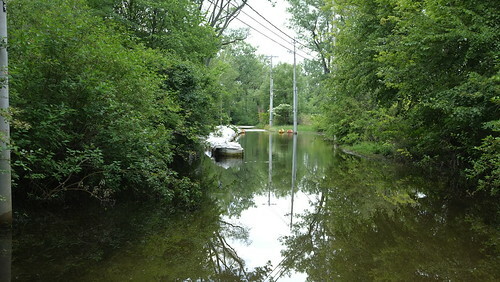 There have been other floods in Toronto, but the vulnerability of Toronto Island was mostly endangered this year by the unprecedented rising of the Lake Ontario. Scientists often refer to a “canary in a coal mine” scenario when they’ve discovered an endangered species. For some reason, disappearing frogs are “canaries” dying from our changing climate that should be warnings for us all but it never is. Well read people discuss it at dinners or over drinks or at the office, “I heard this species of frog no longer exists so I should probably recycle more, use less water and bike to work.” Well, the truth is I do all of those things and I can say with unqualified certainty that my smugness is having zero effect at reducing the effects of climate change. The first victim of climate change will be your beaches. The second victim is your sense that everything will turn out just fine. When you go the Toronto Island now and you see how much of the beaches are underwater or you see the evidence of how the flooding literally moved and changed the landscape you can see firsthand how devastating rising seawaters will be. I’m not saying this year’s flooding is proof of climate change. That would be unnecessary, but it definitely illustrates it in real time, right beneath your feet. The city has said the loss of just ferry revenues to the islands may add up to $5 million and that doesn’t count the loss of local businesses and jobs. People are right to be concerned that some climate change counter measures may result in job losses in the oil industry but not doing anything is already costing us jobs. The only difference is those jobs are spread out over an entire local economy and not in one industry run by three or four large companies. What’s fascinating to me are those people who say we can’t afford to build new parks in the city. Clearly we can’t afford not to. 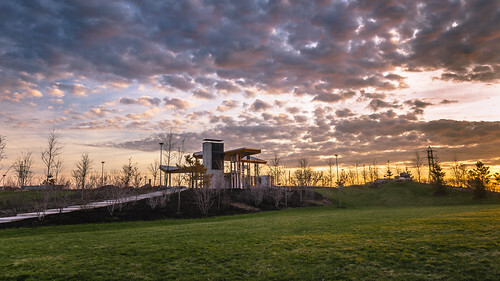 The accidental Tommy Thompson Park protects Toronto Island Park from erosion, the planned naturalization of the Don River and green space of the Port Lands would help fight the Don Valley (and the Don Valley Parkway) from flooding and Corktown Common protects the low lying Canary and Distillery District from flooding. That kind of green space gets me off my couch and out the door which keeps me off a different kind of couch: a therapist’s.